Diversified Energy uses infrared cameras to see light that is in the heat spectrum, with brighter colors indicating warmer regions and darker colors indicating cooler regions. The use of thermal photography allows us to detect temperature variations and problem areas in the home. 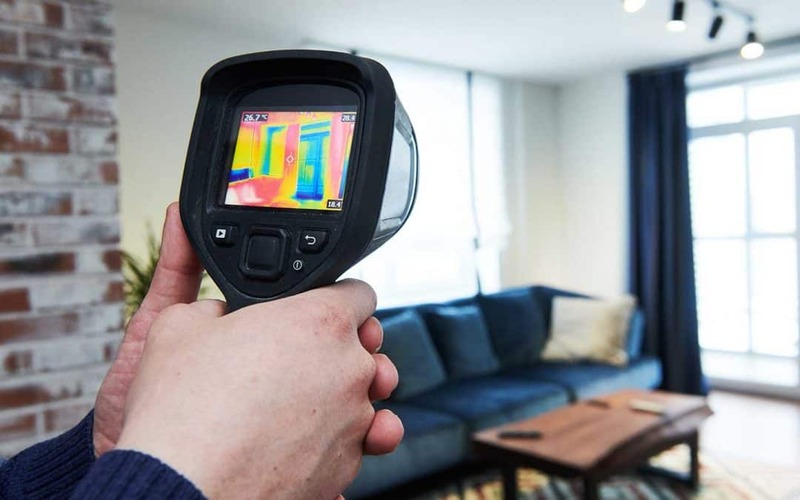 Incorporating thermal photography into an energy audit serves as a quality control tool to ensure that insulation has been installed correctly and to discover where air leakage occurs in the home’s conditioned envelope and duct-work. We commonly run these thermographic scans with a blower door test running. As use of a blower door and duct blaster will help determine and quantify how leaky the house and duct-work is, thermal photography helps us “see” where this invisible air leakage is occurring so that it can be sealed properly. The blower door helps exaggerate air leaking through defects in the building shell, and such air leaks appear as different colored streaks on the infrared camera’s screen. Diversified Energy is Level 1 Thermal/Infrared Thermography Certified and will expertly detect any air leakage in your home when conducting a 360 Energy Audit.